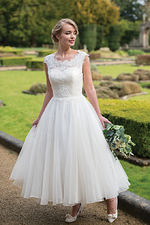 Floral embroidered lace covers the elegant sweetheart neckline and bodice of this stunning fit and flare style. We added horsehair ruffles to the mermaid to add definition and a touch of sophistication that will be noticed from the aisle to the dance floor. Available with or without matching veil. Shown in Ivory. Available in Pink Champagne/Ivory or Ivory.